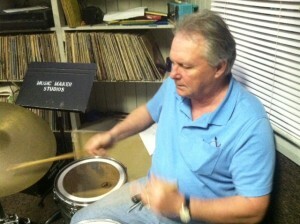 Dan MacDonald was the first drum teacher at Music Maker Studios more than 30 years ago. He was a much liked teacher and developed a strong following of students. He left after 15 years to pursue some incredible professional playing opportunities. Dan has become versed in almost all musical genres. This stems from being a consummate pro. He has the abilit to immerse himself in whatever style he is asked of him from rock to jazz and many other other styles. Dan is a graduate of Berklee College of Music where he studied with the great Alan Dawson, amongst others. Many of his drumset teaching methods come from his studies with Alan. Thankfully, Dan has come back to his roots and is once again the drum instructor at Music Maker Studios. He has quickly become one of the most respected and valued members of the Music Maker Studios staff.